The enjoyment of good food is synonymous with the spirit of holidays. The Blue Dolphin Hotel vindicates the reputation of the Greek cuisine, offering you a choice of quality meals at any time during the day! In the “Celleste” restaurant you can indulge into our dishes that are freshly prepared by our chef using only the finest ingredients. In the morning, start your day off with a hearty breakfast from our American style buffet, choosing among a variety of sweet and savory flavors, fresh fruit and beverages! 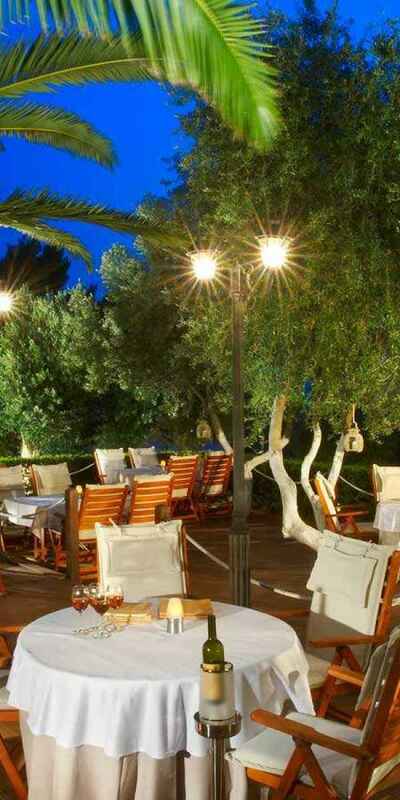 In the evening the buffet “hosts” the fine suggestions of our Chef from the Greek and international cuisine alike. Next to the hotel’s swimming pool, in a cool and pleasant environment is the Tavern of the Blue Dolphin Hotel offering à-la-carte dining. In the Tavern you can enjoy delicious Greek dishes, prepared with traditional recipes and local ingredients, fresh fish and seafood, various snacks and freshly prepared dishes of the day. Since the Greek summer can be really hot, what better way to quench your thirst than a freshly squeezed juice or a refreshing drink at the Pool bar next to the swimming pool or at the Beach Bar on the beach! Make a stop at the Blue Dolphin Hotel’s Snack Bar for a quick bite, get active and continue with your day until late at night! After sunset, the rhythm rises at the Pool Bar, where you can enjoy your favorite cocktails having fun with the music. 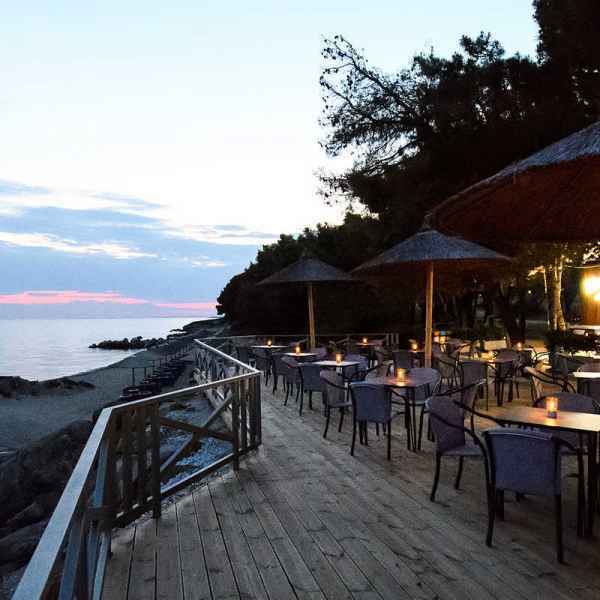 The Beach Bar of the Blue Dolphin Hotel is located in the private, fully organized beach of our hotel, one of the most beautiful beaches of Sithonia. Relax on the comfortable sunbeds enjoying the view of the calm turqoise waters, the white sand and the green of the pine trees. At the Beach Bar you can have cold drinks, coffee and soft drinks and tasty snacks such as pizzas and sandwiches until late in the afternoon. And if you do not want to part the shade of your umbrella, the Beach Bar offers sunbed service. Every evening, with romantic atmosphere, soothing music and spectacular panoramic view of the Toroneos Gulf, the “Olives” Bistro Bar invites you on a journey to the beautiful Aegean Sea. Open from 21.00 until 01.00 every evening, the bar offers all kinds of drinks and cocktails to the sound of music, giving the night a touch of romance. Enjoy your drink while admiring the beauty of the vast ocean and the sunset and allow your mind to travel away. Try Greek creative cuisine dishes, prepared by our chef and his skilled team. On cool days, there's always the indoor bar for relaxation and fun moments with your friends. The Pool bar can be found next to the Blue Dolphin Hotel’s central pool, with a panoramic view of the Toroneos Gulf, ready to welcome you any time of the day. In the morning or the afternoon, quench your thirst with a cool drink or enjoy a tasty snack while sunbathing by the crystal clear water of the pool. Later in the afternoon, lay back and relax gazing at the breathtaking colors of the sunset. In the evening have fun dancing or taking part in the events and activities organized by our team of animators. In the buffet of the Celleste restaurant you can enjoy a wide selection of hearty breakfast and delicious evening dishes as part of your half – board package. The wide variety of flavors, the fine quality of the ingredients used that are locally produced, but also the home-like way of preparing our dishes are just some of the reasons that make your every visit to the restaurant an enjoyable dining experience. In addition, there is a live Cooking (action) of the preparation of dishes by our experienced chefs in our open kitchen. And what better to accompany your meal than a Greek red wine. In the “Celleste” restaurant you can taste the “Flavor of Earth”, a red wine with rich aroma and distinctive flavor, which is bottled exclusively for our hotel. The à la carte tavern of the Blue Dolphin Hotel is situated next to the pool in a cool environment with unparalleled views of the Aegean Sea and the peninsula of Kassandra. 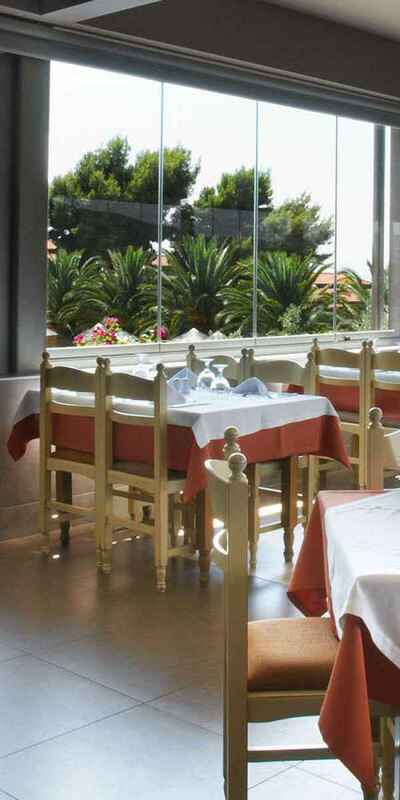 Every afternoon, you can enjoy delicious dishes from both the Greek and the international cuisine alike. Traditional dishes cooked with authentic recipes and local ingredients, fresh fish and seafood, various snacks and freshly prepared dishes of the day are just some chef’s suggestions for a journey full of flavors with a view out to the endless blue color of the sky and the sea.